The ENGSO General Assembly in Visby, Sweden was an important landmark for the EGLSF this year. Our application to be an associate member of ENGSO was accepted, and our board member David Hofstetter was voted to the ENGSO “Equality Within Sports” committee for a two-year term. Other committee members are: Niina Toroi (Chair) – Olympic Team Finland, Ioanna Karyofylli, Ελληνική Παραολυμπιακή Ομάδα - Hellenic Paralympic Team, Rachel May - Engso Youth, Anabela Sousa Vaz dos Reis - Confederação do Desporto Portugal. 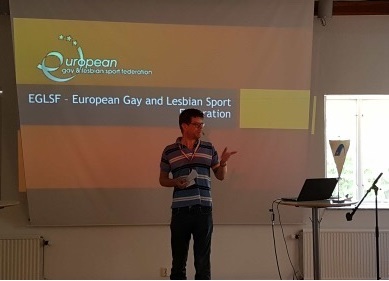 We look forward to working with ENGSO to make sure that LGBT+ rights within sports are represented at the European level.